After the smartphone market, it now seems to be the TV industry’s turn for some disruption from low-cost players in India. Xiaomi is looking to crack the code with its affordable TV offerings, but rival television maker Vu TV has today launched its new range of smart LED TVs. And they’re banking on their Android TV integration as the selling point for this lineup. This TV lineup has been released in three different screen sizes, namely 43-inch, 49-inch, and 55-inch, with price starting at ₹36,999. This is the discounted pricing for the TVs in India as the MRP of the same TV, mentioned on Vu’s official website, is way higher and sits at ₹52,000. Coming to the specifics, this entire range comes equipped with a 4K Ultra-HD screen that boasts of a 3840×2160 pixels resolution. Vu claims that their TV range has wider viewing angles, higher dynamic contrast, higher peak brightness, as well as pixel mapping. All three TVs also brings along dual 10W box speakers, backed by Dolby Digital technologies. The highlight of Vu TV 4K lineup will, however, to be the fact that they offer you a stock Android TV experience out of the box. The TVs are running Android 7.0 Nougat, which is coupled with the built-in Chromecast feature that allows you to stream your screen’s contents directly from your phone to the TV. 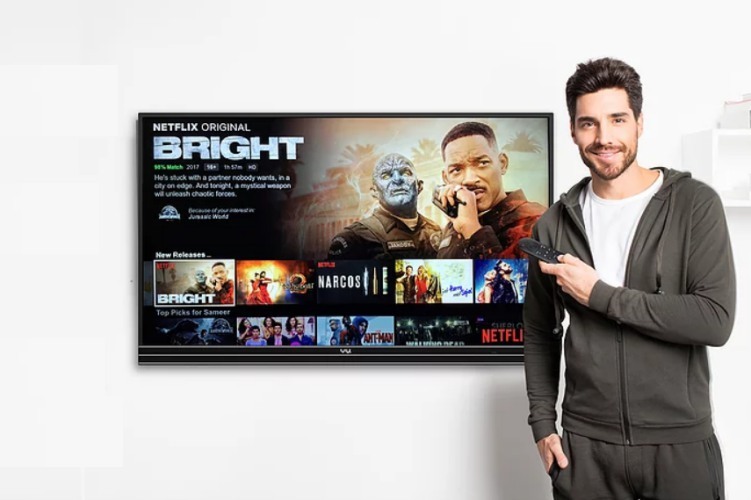 Being powered by Android TV gives the Vu TV lineup and edge over Xiaomi’s latest TV offerings because you get access to the Google Play Store and the plethora of video-on-demand (VoD) apps available on it. Xiaomi is a low-end brand. They’ll take market share from other low-end brands like Micromax and others. We compete with brands like Sony. The Vu TV lineup is powered by a quad-core processor, coupled with 2.5GB RAM and 16GB internal storage. You get HDMI, Wi-Fi, Ethernet, Bluetooth 4.2, 3 HMDI and 2 USB-A ports in terms of connectivity options. Now, for controlling the TV, you’re being offered two options. One of the TV remotes hosts an 11-button design, with a mic button to activate Vu ActiVoice that can help you search for content on your Android TV. You don’t even need to point this remote at the TV since it comes with Bluetooth integration. The other remote has a more standard feel to it and is used via Infrared Radiation (IR) at the top. The Vu TV lineup will go on sale on March 16, at 12 midnight, exclusively on Flipkart. The retail price of the TV will vary between₹36,999 for the 43-inch smart LED TV and ₹55,999 for the 55-inch variant. The 49-inch variant that sits in the middle will cost you ₹46,999.